Festival Venues – Emirates Airline Festival of Literature. Access between Dubai Festival City Mall and the InterContinental and Crown Plaza hotels is available from Festival Tower, the Marks & Spencer store entrance and the mall entrance next to Hard Rock Cafe. Click here to view the Route Map. The Al Ras rooms, Al Amwaj, Al Khayma, Al Majlis, Al Waha and Al Rimal are on the Lobby floor, along with the bookshop and prayer rooms. The Al Baraha rooms are on the Waterfront floor. Terra Firma Restaurant is in the InterContinental Hotel, and Creative Meeting Space is in the adjoining Crowne Plaza hotel. Festival City is a five-minute bus journey from Emirates Metro Station (Red Line), using the F08 or 064A buses. 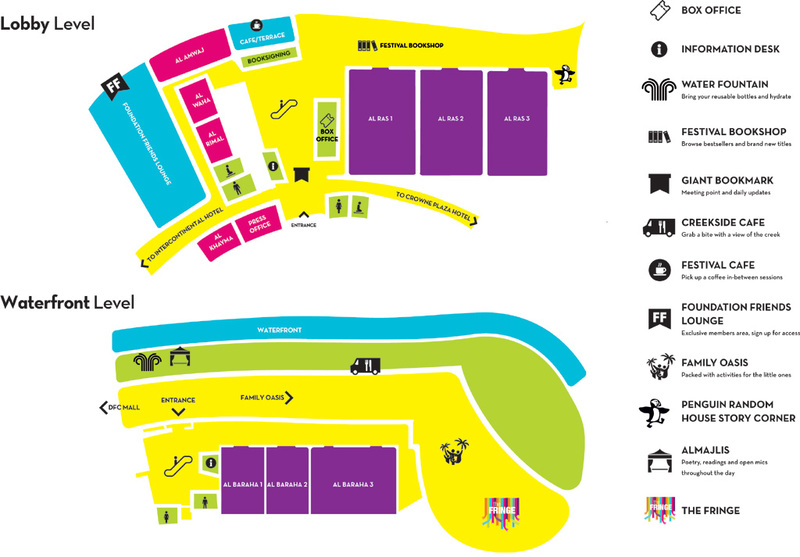 Please be advised that Novo Cinemas is 20 minutes’ walk from the Events Centre, InterContinental Hotel.